The European Poker Tour comes to London and Bruce is waiting! Second place for £64200 is landed after two gruelling days of play. After recovering from a gruelling month in Las Vegas where he won four seats into the big one, Bruce Atkinson could not help becoming Elvis again in the European Championships at the Vic. He had been prepared to take less when a deal had been struck at Mike Magee 185K, Men the Master 165K and Bruce 145K, but Men changed his mind. After receiving a necessary portion of verbal abuse, Men attempted to steal a pot from Bruce, who had checked his straight on card 6. No improvement on the end meant that Bruce was now chip leader. Multi gold bracelet winner Men was unable to recover and a new deal was struck between Mike and Bruce. After plying him with Champagne, Vic manager Terry Schofield persuaded the new champion to transform himself into the King of Rock and Roll. Not needing to be asked twice, Elvis proceeded to entertain upstairs downstairs and in reception. Las Vegas usually means lost wages. Not many poker players make a profit after 28 days of tournaments without cashing in the first four. Bruce 'Elvis' Atkinson got off to a flying start by winning a super satellite seat for the big one. He then proceeded to win three more, two of them on the same day. Not satisfied with this, shared a further four single table satellites and winning one outright for $10, 000. In the main events, Bruce found it a little harder, although he placed in three out of the five he entered, finally coming sixty first in the 'big one' for $15k. The day before the start of the main event he togged up in full Elvis regalia upstairs and downstairs at The Horseshoe. But Bruce has a disappointment apart from not yet winning a big one. His son Greg is at Oxford reading Chemistry and he missed the recent tournament held at the Union. "I will not miss the renewal next year", says Bruce. 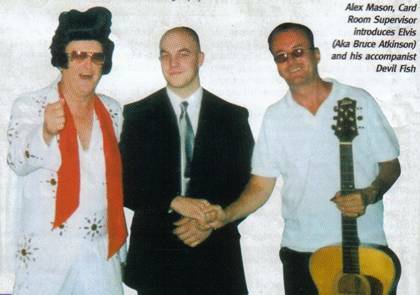 Elvis is joining Jimmy White and Steve Davis in the final of the Ladbrokes.com Poker Million Masters on the 16th March 2003. The action can be caught every week from the 7th February on Sky Sports, where you can follow the progress of the celebrities and a selection of the world's best poker players chasing the £100,000 prize. Elvis joined the Ladbrokes Poker Million Champagne reception at London's Hotel Metropole. Dressed in full regalia he provided impromptu entertainment with Dave (Devil Fish) Ulliott on guitar. Elvis sang 'All Shook Up', 'Blue Suede Shoes' and 'Wooden Heart' raising £400 for the Martletts Hospice in Hove. 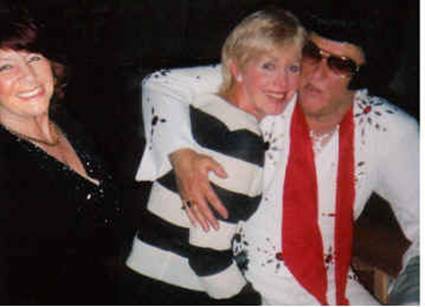 Elvis joined show-biz wizard Dan the Man and Lady Caroline in a charity gig at the Rendezvous Casino in Brighton on the 8th December 2002. They raised over £800 for the Martletts Hospice in Hove. Quipped Elvis "The King got his own back when I hurt my foot jumping off a table after singing 'Blue Suede Shoes'.